Mondo Wilma Thafeni was born in Sebokeng, Gauteng province. She was raised by her aunt and uncle after her mother passed away when she was 6 years old. Life was isn’t easy. At age 17, her aunt chased her away from the house. She was forced to fend for herself, and life became very difficult. She dropped out of high school, and made her way to Johannesburg. There her life became a confusing tangle of destructive peer pressure, drugs and alcohol, and she was not proud of how she was living. Mondo says God’s grace changed her completely, and that God’s love touched her profoundly. 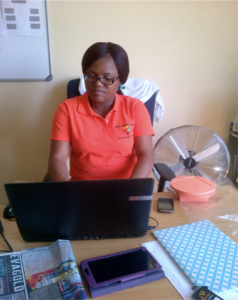 She made her way back home and stumbled across Etelang Pele, a non-profit organization serving the poor in Sebokeng. She says that, “Volunteering at the Etelang Pele began to change my character, to make me truly want to help the needy, to see that many people have challenges in life.” She even started to attend church, and through the friendship of God’s people, her life began to have new purpose and direction. In Mondo’s words, “Working with the community and the poor made me realize that we must trust in God for our lives, and change our course to follow the path the Lord chooses. Nothing is hidden before Him.” She never forgot how her uncle raised her, and she even adopted a child because she was determined to give someone love and invest in her community, just as he had done. Mondo saw the desperate situation of children in the neighboring township of Klipkop, and after conducting a needs-analysis of the area, she approached Second Table Ministries and asked for a chance to begin a new ECD center in this tragically under-served community. STM partnered with Etelang Pele to provide Mondo with startup funding to help establish this new center. She was, “happy about the opportunity that STM gave us. We managed to create job opportunities for our community, and build a crèche that helps the poor.” She now serves 70 pre-school students, and up to 395 children are fed, assisted with activities such as homework, receive psychosocial counseling, and/or attend the center’s support group for HIV/AIDs. With the help of North Point Church in the United States, Maranatha URCSA Church and the Driehoek Dutch Reformed Church in Sebokeng, she is able to provide neighborhood families with meals to alleviate the chronic hunger that plagues so many in Klipkop .